We're paying too much for gaming headsets. Anything over £50 in the studio headphone market gets you industry standard sound quality and comfort. Anything over £100 in the audio enthusiast market (think umlaut-heavy German manufacturers) buys you crystalline sound and luxurious comfort. Anywhere between these two price points usually affords a set of acceptable cans offering decent sound quality and a functional mic. 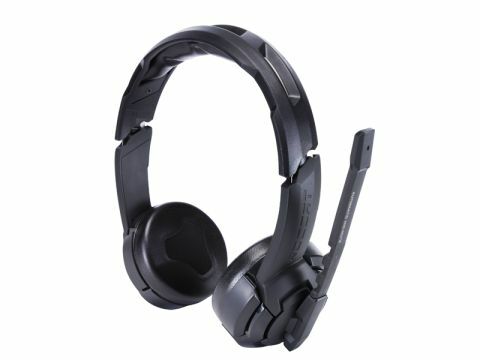 Roccat's Kulo headset looks and feels cheap and flimsy. Worse, it's another graduate of the 'crown of thorns' school of headset comfort, cutting into your cranium and making your ears sweat against each speaker's faux leather exterior. The volume control is a clumsy plastic lump. Oh, and the sound quality is great. Hold on, what? It just doesn't fit with the package: excellent bass response, surprising clarity, from soft jazz and empty shells dropping to the floor to death metal and RPG fire, the Kulo has nuances beyond its sad, feeble physical form. They seem derivative of Boses' QuietComfort noise cancelling cans, and while their much cheaper build produces a slight seashell effect, it does filter out a good deal of ambient noise. It's a strange compromise of sound quality over comfort and gaming application. Given the length of time gamers wear their cans per session, comfort has to be a design priority. We'd expect more for £50.